'A Second Chance', as expected, is a major box-office hit on its opening day alone, as Star Cinema releases this official announcement that A Second Chance, the sequel to the 2007 classic hit 'One More Chance', has earned a huge P35-million, later updated as P43.3-million, gross receipts during its opening day, November 25, 2015. 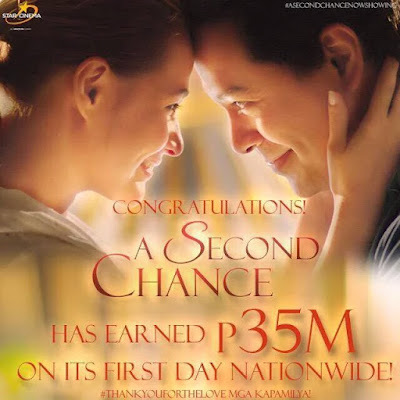 Certainly the highest opening gross ever for a John Lloyd Cruz-Bea Alonzo and the highest among non-MMFF films, 'A Second Chance' is no doubt the biggest movie event of the year and is now set to be screened in over 300 theaters starting today, its Day 2 in cinemas. The boxoffice results on opening day seemed unaffected by those spoilers saying "namatay si Popoy" ("Popoy died") in the movie ending after its world premiere Tuesday night. It instead generated much curiousity as many flocked to theaters with "to see is to believe" and be one who the firsts to know if Popoy, the beloved character of John Lloyd, indeed died in the story.